Description: Bird's-eye view of a generic town in England. 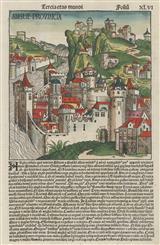 This is the earliest printed representation of an English town. Coloured. 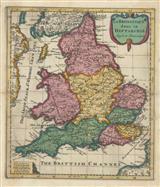 Description: The first atlas map of England and Wales. Issued by Abraham Ortelius in the Theatrum Orbis Terrarum. Original hand colour. 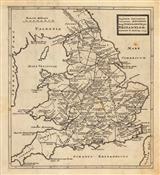 Description: England and Wales, from the second edition of Speed's seminal atlas, 'The Theatre of Great Britaine'. Flanked with costumed figures ranging from the nobility to country folk. Description: South East of England, from Leicestershire, Gloucestershire, Wiltshire and Hampshire across to Suffolk, Essex and Sussex. With decorative cartouche and 'silk sea'. Rich original colour. Description: South-East England. Published at the height of the Dutch Golden Age of map making, by two of its leading figures. Coloured. Description: Lancashire and North Wales. Decorative cartouche. Coloured. Description: The west country of England and Wales from Wiltshire to Cornwall including Dorset, Somerset and Gloucestershire. Embellished with two ships. Coloured. Description: England and Wales. Large scale map on two sheets joined: Inset of the British Isles on upper right. Coloured. 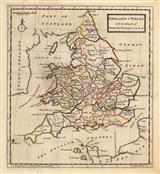 Description: England and Wales divided into the ancient Seven Saxon Kingdoms or Heptarchy. F. Halma edition. Vivid original hand colour. Description: England and Wales. Decorative border and cartouche with allegorical figures and scenes. Coloured. 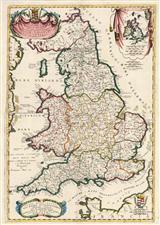 Description: England and Wales featuring a decorative title cartouche. Description: England and Wales. Original colour. 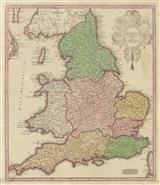 Description: England and Wales divided into counties. Original colour. Description: A map of the Roman road system as drawn by noted antiquarian and druid, William Stukeley.